January 6, 2018 Categories Uncategorizedaccessorize, dorothy perkins, fashion, haul, kiabi, matalan, new look, noos, river island, shopping, styleLeave a Comment on End of Year 2017 HAUL! If you find a better way than a BIG HAUL to start the blogging year on a better note, you are sadly mistaken. I went shopping on the 29th and 30th of December since I’m donating many of my things to make space for new ones. You know, the “out with the old, in with the new” theory, which I am trying to implement this year, where for every object I buy, I need to get rid of one. Either by donating or – if not in good conditions – throw away… so many choices! On the 29th, I only went to two stores – Kiabi and Matalan, while on the 30th, I spent the whole day – literally from 9am till 4pm! – shopping in the capital of shopping in Malta: Sliema. First up are these pair of leggings with metallic fibres. It is super comfy to wear on a nice dinner when you just can’t be arsed but at the same time you want to look good without any effort. It looks so damn good with a cute top or jumper tucked in! And since a girl cannot have too many jumpers, I got this soft knit sweater with puff sleeves. First up is this cosy faux fur gilet. Even though it looks black in the picture, mine had a bit of white and grey in it. I love how it can go with anything from casual to smart! Judge all you want, but these fur-lined boots are too adorable! These don’t have that rubbery type bottom, as it’s actually a hard plastic. This velvety padded coat which I got is so cosy I was reluctant on removing it. Bonus points on the detachable fur collar! Then there’s something to get me more motivated to workout in winter: this grey edgy sports bra. From Dorothy Perkins, I bought this black a-line skirt with pearls embellished all over. If you’ve been following me for a while, you know I cannot get enough of pearls as much as frills and jumpers! A store which has opened just two or three weeks before I visited, Noos is in the heart of Sliema. A former co-worker of my sister’s told us about it, and we just HAD to check it out, and thank goodness we did! I found this cute pink faux fur mini backpack. And it’s actually more spacious than you think! PS. Apologies for the lack of HQ photos of the bag! Quickie one since I had to put everything back in my closet. Lately I have been obsessing like CRAZY over hooped earrings. Not the ones you can literally put your fist in, the cute ones where up to two or three fingers can fit. These pair from Accessorize were the perfect fit. 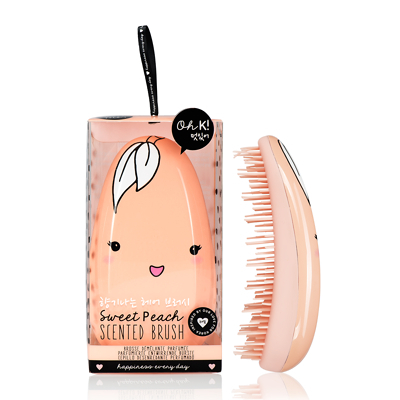 At River Island, I got this adorable peach scented detangle brush, and yet another set of small hooped earrings. Last store for the year was New Look, my safe haven and where most of my clothes come from. I was looking for some casual trousers that were yet also smart-looking, you know? I saw these, and I fell instantly in love. They look casual but feel so darn smart! Even with heels these trousers look smart casual at best!